Egyptian officials have said that there were no survivors after a Russian airliner, Metrojet Flight KGL9268, crashed in central Sinai killing all 224 passengers and crew on board. The Airbus A-321-200 departed the holiday resort of Sharm el-Sheikh on a scheduled flight to the Russian city of Saint Petersburg. Radar contact was lost with the aircraft 20 minutes after it took off. The flight was carrying 214 Russians and three Ukrainians. Seven of them were crew members. Russian President Vladimir Putin has declared that Sunday will be a day of mourning and has ordered a criminal investigation into the crash against Kogalymavia, owners of Metrojet. This is normal protocol for air crashes involving Russian airlines. The Russian Association of Tour Operators has released a passenger manifest in the last few hours. Rescue teams have reached the crash site, which is difficult desert terrain in the central region of Sinai, Egypt. The rescue teams have reported that the Airbus A321 split into two parts, with one part burning up and the other impacting on mountainous rock, Flight KGL9268 was flying at an altitude of 30,700 feet when it disappeared off ATC radar. Initial reports say that the pilot reported technical difficulties and requested a return to Sharm el-Sheikh Airport, though an emergency mayday was not declared. 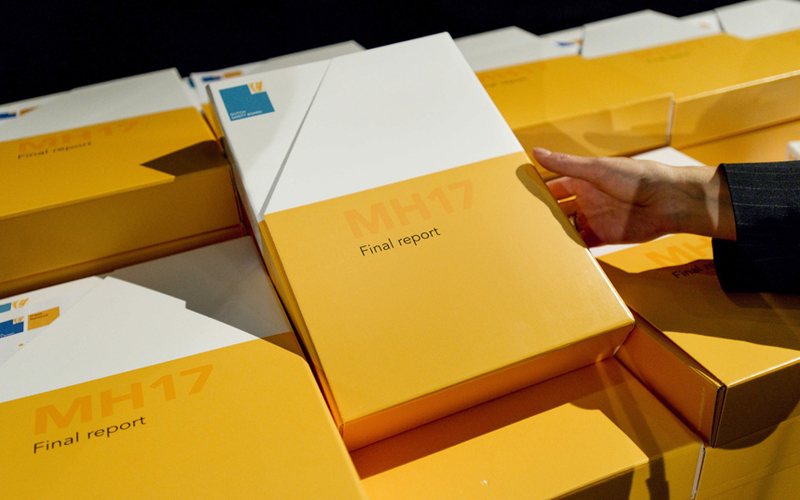 Oksana Golovin, a spokeswoman for Kogalymavia, said the airline had no reason to suspect human error and that the aircraft was fully serviced. At a press conference, she said that the Captain had 3,800+ hours of flying experience. According to the Egyptian state cabinet in a released statement, the aircraft took off at 05:58 Egyptian time (03:58 GMT) from Sharm el-Sheikh and at 06:14 the aircraft failed to make scheduled contact with ATC in Cyprus. 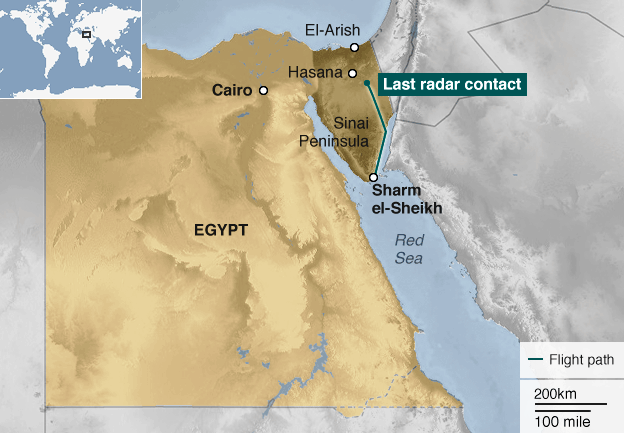 At 06:17 the aircraft crashed on the Sinai peninsula. The flight was due to arrive at Saint Petersburg's Pulkovo airport at 11.12 (Egyptian time). The terrain at the crash site is difficult, though rescue teams are reported to have recovered up to 100 bodies, with many still strapped to their seats. 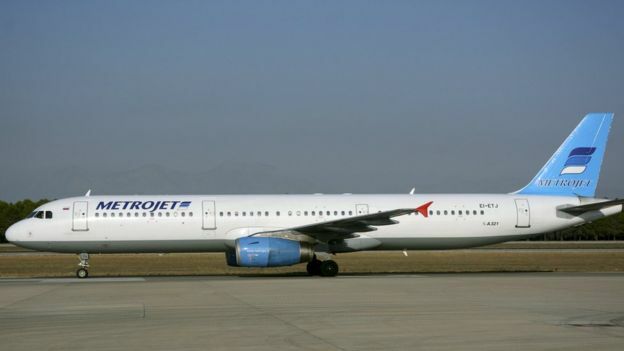 Kogalymavia airlines rebranded as Metrojet in 2012, was originally founded in 1993 and the airline has a fleet of seven A321s and two A320s. Flight KGL9268 was serviced by one of the A321s, built in 1997 and registered as EI-ETJ. Live flight tracking service FlightRadar24 recorded the aircraft at FL310 and losing 1,500 metres (about 4,500ft) in less than one minute before radar coverage was lost. Weather conditions were reported to be good at the time. The Sinai region is considered an active militant region and shortly after the aircraft crashed NOTAMs were issued to airlines flying over the region. Militants in the area are believed to be equipped with manpad surface-to-air weaponry but there is no evidence that the aircraft was targeted despite claims by the Islamic State (IS) that it was responsible for the downing of Flight KGL9268 late today. The shoulder-launched manpad does not have the capability to reach an aircraft at FL310. Investigators are examining the possibility of catastrophic structural failure and rescue teams are still searching for the voice and date recorders at the crash site. The most outstanding issue with this aircraft occurred in 2001 when it suffered a tailstrike while landing at Cairo Airport.